Sarasota is one of the top property destinations in Florida, offering year-round warm weather, beautiful beaches and keys, and a buzzing downtown area. The city overlooks the Gulf Coast of Florida and has long been a hotspot for retirees and holiday makers. Property in Sarasota is always in demand and is quite pricey, although it is not as expensive as Miami or Fort Lauderdale. The beachfront areas are the most expensive, along with homes and apartments on the main keys, while the likes of Glen Oaks and Gillesepie Park (near downtown) are cheaper. The downtown area buzzes day and night with great shopping and dining options, and is particularly popular with those looking for serviced apartments. If you are after a plush pad, look to North Sarasota - especially Sapphire Shores or Indian Beach - while South Sarasota is also on the up. Lido Key is the main island for property, as it is the closest and has the best facilities, as well as some of the nicest beaches and real estate. Longboat Key is also popular and is generally a sound investment. Most areas of Sarasota are good for renting serviced apartments, although you should expect to shell out for any place within shouting distance of the beach, and particularly on Lido Key. Leases for serviced apartments are usually 12 months minimum, with monthly deals very tough to get. Furnishings are generally top-notch and most places come with maid service, often being advertised online. Sarasota is a good investment when thinking of buying apartments or houses, with prices on the rise (generally) over the last couple of decades. 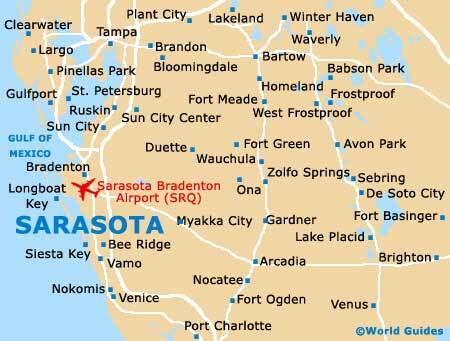 Retirees will be particularly bowled over as the weather, facilities, and services in Sarasota are all excellent. Demand for apartments and houses in this part of Florida is high and foreigners can buy without restriction. Expect to pay around seven percent for taxes and fees when purchasing apartments and houses in Sarasota. As a non-US buyer you will also be subject to more background checks and paperwork. You can go it alone, but the sheer number of districts and the ins and outs of buying in Florida is enough to make anyone's head spin. There are many registered real estate agents in Sarasota and most of them have websites and email addresses to make things easier. Allen Real Estate Services Inc.
Allen Real Estate Services deals mainly in luxury homes along and near the best beach areas. Specializing in the gorgeous keys, Sarasota Siesta Key Real Estate has an eye for Siesta Key, Lido Key, Longboat Key, Bird Key, and Casey Key. Jennette Properties deals in property rentals on the main Sarasota keys, as well as further afield.